Back when I wrote about Steve’s Ice Cream, I mentioned that I was first drawn to the pints because of the hand written labels. 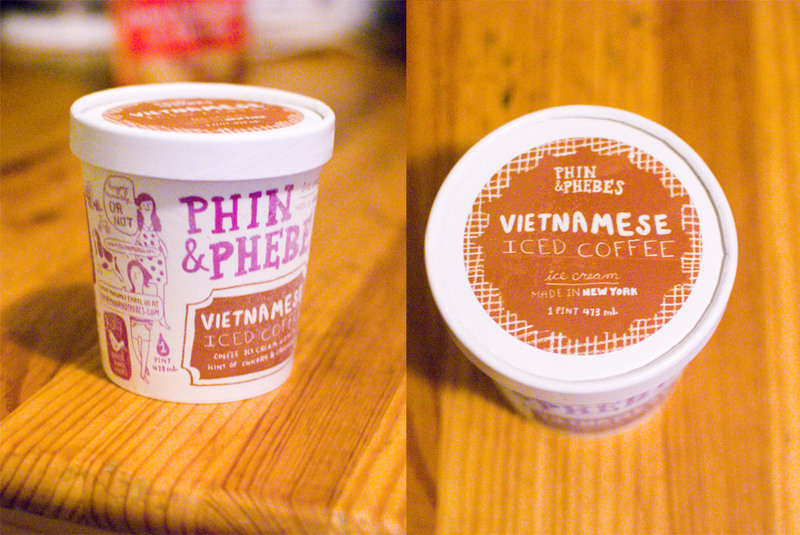 I had a similar attraction to the whimsical designs on the labels of Phin & Phebe’s ice cream. Imagine my delight when I discovered they are a local company, started by a couple right here in Brooklyn. Since I first discovered them a couple of months ago I’ve done my duty and sampled many of their flavors. The Vietnamese Coffee was rich and agreeably bitter; the Ginger Cookie Snap had chunks of cookies in it; the Coconut Key Lime had rich coconut flavor with the sour tang of limes. My favorite by far has been the Banana Whama: banana pudding ice cream (not banana ice cream, banana pudding ice cream) with chunks of vanilla wafers. Even now in the dead of winter, I’m happy to eat this locally made frozen treat.